Choosing a bicycle that is right for you is the biggest single factor in determining how much you will enjoy your riding experience. So make sure to do your homework beforehand. You will be glad that you did. There are a lot of choices available but it does not have to be confusing. You can zero in on your perfect bike, easily, by reviewing the questions and different styles shown below. You may find the best choice is not what you had envisioned at all. Look for a bike that suits your needs, your body, your style, and one that you can live with comfortably for years to come. Here are some great cycling tips you may want to review as well. Some of the questions that you need to ask yourself when choosing a bicycle are……. What have you ridden before that you liked or disliked? What is most important to you? Is it speed, comfort, versatility, style, easy storage, or ease of riding? Who will you be riding with? If it is with a group of friends you should buy the same type of bicycle. What kind of terrain will you be riding on? Is it flat, or hilly, or some of both? Do you want the simplicity of one speed or multiple speeds for easier riding on hilly terrain? Where do you plan to ride? Is it close to home or will I have to transport my bike to another location? Will you be riding off-road or on paved surfaces? Do you have a budget that you want to stay within? Remember you will need to buy some accessories to go with your bicycle? Do you have any physical limitations that you need to consider? Is ease of getting on and off the bike an issue? Would you be more comfortable with a three-wheeler that has a more stable ride and easier boarding? Would pedal assist, as with an electric bike, be more suitable? Here is a broad selection each with their own merits depending on your needs and wants. Road bikes are designed primarily for speed and distance but are not suited for off-road or rough terrain. They appeal the most to very active boomers who have been riding for years. The aerodynamic riding position and the skinny tires make pedaling easier but the riding position and thin saddle can be tough on boomer bodies. A mountain bike is made to be very rugged with higher ground clearance for clearing obstacles on rough terrain. They are heavier than road bikes to allow for a harsher riding environment. They usually have knobby tires and high gear ratios to enhance climbing ability while riding off-road as well as shocks for improved ride and handling. Off-road riding generally, requires a high fitness level. A hybrid bicycle, sometimes referred to as a crossover, combines some of the best features of a road bike with some features from a mountain bike making it extremely versatile. They use larger diameter wheels than a mountain bike and are designed to give the rider a much more upright riding position than a road bike. This not only enhances visibility but is easier on the riders back. A cruiser bike is sort of a forty's retro bike that you see in the park, or at the beach. They are very popular with older boomers that just want an occasional leisurely ride at the beach or in the park and aren't concerned with a lot of added features. Cruisers are usually single speed and rather heavy so they aren't well suited for hilly terrain. Boomers and seniors are opting for step through bikes more and more when choosing a bicycle. Ease of mounting and dismounting is especially a plus if you are not as limber as you once were. Almost all bicycle styles are available now with step thru frames due to their popularity. The EZ boarding bike was specifically designed for boomers with all of the popular features to give the rider the ultimate in comfort and simplicity. The ease of boarding and uniquely designed aluminum frame with heavy duty gussets for make this bike a favorite a boomer favorite. There is a wide range of available gear speeds to help make a perfect choice. The Day 6 bicycle was designed specifically for easy and comfortable riding. The designer had severe back problems so it is designed to be very forgiving on backs, butts and hands with a wide range of available seat configurations. The pedal forward design lets the rider sit with both feet on the ground while stationary. And the high handlebars put an end to numb hands on a long ride. Fat tire bicycles are the new "in" bikes for off road cycling. Most mountain bikes or cruisers use tires with a 2 inch wide tread but fat tire bikes can range from 3 inch all the way up to 4.25 inches wide. This can make a huge difference when riding on sand, loose stones or any irregular terrain. The extra cushioning from the fat tires can sometimes negate the need for shocks but will require a bit more effort to pedal. A fat tire electric bicycle can be an awesome bike for pedal optional off road riding. If you need a little help on a climb or just for the fun of riding a self powered off road vehicle they can be just the ticket. The fat tires cushion the ride and smooth out the bumps on a rough trail but will require a bit more effort to pedal. A folding bike is great for easy storage and transport and are popular with boaters, commuters, and apartment dwellers. Many of them ride and handle almost like their full-sized cousins. Current designs enable fast and easy folding and unfolding. In town commuters often find them a good alternative to driving or public transportation. The Montague full size folding bike is an extremely rugged design which utilizes a quick release on the frame for 20-second folding and unfolding. 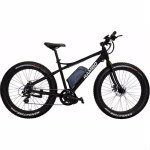 Available as an urban or suspension mountain bike. They are a good choice for riders that want a full sized bike but may have limited storage space. An electric bike is another option for boomers that would love to ride but feel they need pedal assist. They are pedal optional so the rider can pedal for exercise, use the motor on climbs, or sit back and let the motor do all of the work. An electric bike can typically go up to 40 miles at 20 MPH on a single charge. They combine ease of riding with the fun of a self-propelled vehicle. A recumbent bike is fast and comfortable and is available in a wide range of configurations. Their popularity with boomers has increased dramatically as they become more available. They are different enough that it takes a little getting used to but many riders won't ride anything else once they have ridden one. Actually, most recumbents are three-wheeled now for easier balance. They are also very forgiving on backs and butts. A tandem bicycle is the famous bicycle built for two. They can be fast, with the right team, but it takes practice to learn to ride one. The front rider (Captain) handles the steering and the rear rider (stoker) adds pedal power. They are great for boomer couples that want to ride together or for riders of different abilities or fitness levels. 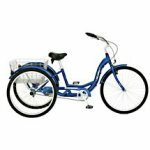 The Orion tandem recumbent tricycle allows you to be mobile and enjoy cycling regardless of some prior limitations. The driver and the passenger are seated next to each other and can engage in conversation and enjoy recreational fun together! A great alternative to your golf cart to go to stores or the club-house! 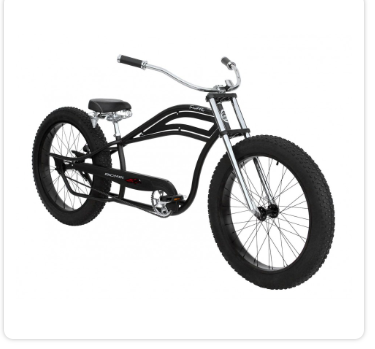 A stretch Cruiser bicycle can be a great choice for a plus size rider. Why be uncomfortable on a standard size bike when you can sit back and ride in comfort on a larger bike with a stretched fame? The frames are beefy enough to accommodate heavier riders as well. Actually, a lot of riders just like them for their laid back "easy rider" look. What makes the Trailmate Funcyle really unique is it has front wheel drive and you steer it with your body. The seat even pivots so you can lean into a turn. You just hold on to the handles on either side or the seat and lean right to go right or lean left to go left. It has a short wheel-base so tight turns are no problem. You may also want to consider an Adult tricycle. They are popular with seniors as well as people with handicaps or even balance problems. They are easy to board and offer a very stable platform. The rider can sit comfortably when not moving and with both feet on the ground and there is a vast selection of styles to choose from.